Every teacher on the faculty engages in Columbus Jewish day School conscious, intentional, and thoughtful method of “curricular integration” to help students connect the dots of their learning, and beyond, to help them connect the dots inside of them of who they are. In science, the CJDS kindergarten class completed an oil and water experiment. Students hypothesized what might happen when you mix oil and water together. Students enjoyed adding drops of food coloring to the water. Next, they poured the oil and water in to the same drinking glass, and watched how the two liquids separated. The kids learned about density. In the picture above, the oil floats on the top of the water, proving that oil is less dense than water. The Shabbat unit in kindergarten allows students to connect to math concepts by sorting, measuring, counting and making paintings of Shabbat candlesticks. In a lesson integrating Humash with Math, 4th graders learned what a hard task Rivkah faced in offering to water Avraham’s camels. The class read the parsha (portion of the Torah) detailing how Avraham’s servant showed up at the well and asked for some water to drink. Rivkah then not only offered the water for Avraham's servant but also offered water for the ten thirsty camels that accompanied the servant! The students wanted to figure out how long it would have taken Rivkah to complete her task. Each camel drinks about 50 gallons of water, so our students calculated how much water Rivkah would need from the well for the camels (500 gallons). Students then performed a simulation to figure out how long it would have taken her to complete this deed. 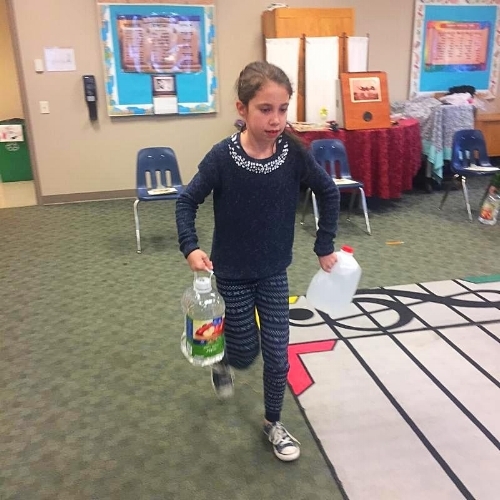 Eleven students carried a total of 165 gallons of water in 5 minutes, then extrapolated how long it would take one person to carry 500 gallons. The simulation took on the appearance of a relay race, but students came away with a new respect for Rivkah, and some new math skills too! Fifth and sixth graders compose poetry connected to the Middah (Jewish Value) that they are studying. CJDS kindergarteners study the fourth day of creation: the creation of the sun, the moon and the stars. They spent time outside observing the morning light and their long shadows. Student shadows were then measured at different times throughout the day. The fourth day of creation unit also allowed kindergarten students to enjoy some cookies while learning about the phases of the moon. During yoga, CJDS first graders create Hebrew letters with their bodies. Here are two students making the Hebrew letter, "Hay." 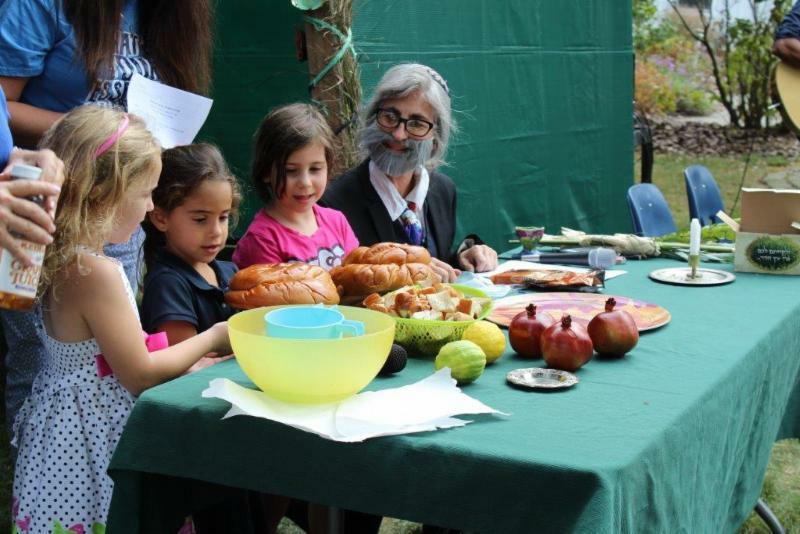 During an all-school assembly for the holiday of Sukkot, students and parents alike learned about the three Mitzvot of Sukkot and welcomed surprise “guest,” Janusz Korczak in to the CJDS Sukkah. Janusz Korczak (1878 - 1942) was born in Warsaw. He was a pediatrician, an educator, and a successful author. Korczak chose to dedicate his life to children so they could be recognized and respected. Students spend a day at Wexner Heritage House decorating the Sukkah, teaching residents about finger knitting (their creations were used as decorations for the WHV Sukkah), having lunch, and enjoying music and time together. In preparation for Rosh Hashanah, fourth graders end their week with a special activity, the tasting of simanim, or special symbolic foods. Students sampled traditional foods such as round challah, apples and honey, gefilte fish with horseradish, dates, carrots, scrambled eggs with leeks, and pomegranates. Each food represented a specific blessing for the upcoming holiday. Many of the foods are based on puns in the blessing. The students then wrote their own Rosh Hashanah blessings with their own puns, like “have a beauTEAful year,” and made a book of blessings to take home for the holiday.